With all the excitement around Flash storage in the data center these days, I wasn’t keen to hear about yet another startup that promised to revolutionize SSDs. But with a hot team behind it and the promise to change the economics and infrastructure around storage, I decided to talk to Pure Storage. The company today came out of stealth mode and has raised a $30 million Series C round from Redpoint Ventures, Greylock Partners and Sutter Hill Ventures with Samsung participating as a strategic investor. Om covered Pure Storage a few months back, primarily because its founding team comes from Zimbra, Veritas and Sun. Plus it counts as angels, the founders behind VMware (s vmw) and DataDomain — both infrastructure companies that contributed big technologies to enterprise IT. 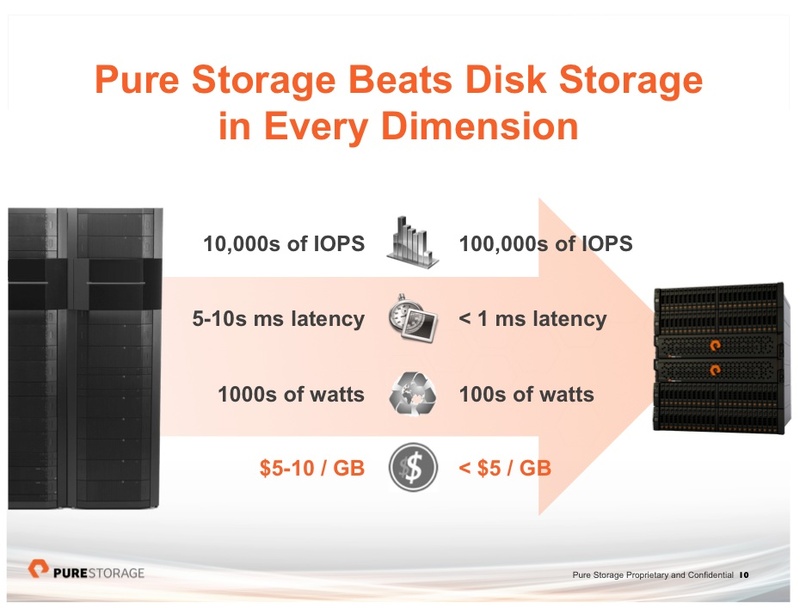 Pure hopes to do the same thing by offering a storage array for enterprises comprised solely of Flash memory. Flash memory provides much faster access to data than hard drives, but is far more expensive. However, Pure CEO Scott Dietzen says the Pure array brings the costs of Flash to lower than $5 per gigabyte, which is less than what a similar product from EMC (s emc) or NetApp (s ntap) that uses hard drives would cost, and far less than a hybrid product such as what’s on offer from Violin Memory or Nimbus Nimble would. Pure also introduces a new product category for those interested in Flash —which is just about everyone. While there are plenty of webscale companies deploying Flash memory in servers using products from Fusion-io (s fio) and even larger players such EMC trying to deploy Flash memory as part of combo storage arrays along with hard disk drives, Dietzen claims Pure offers the first all Flash enterprise-class array, however Nimbus also offers an all-Flash product. He says the cost of using Flash is lower than hard drives because of the software Pure runs to shrink the amount of data stored in memory. Pure combines technologies such as de-duplication and compression to shrink data so a little Flash can go a long way. But beyond the hype, if Pure can do what it says it can do, it doesn’t just open the door for widespread Flash adoption inside corporate data centers, it flings it open and drags enterprises right on through. And what about those companies such as Facebook currently using the SSDs inside servers either through products like Fusion-io’s or through attached SSDs that run software to make them easily addressable by distributed nodes? Could webscale operators turn toward storage arrays and Pure? Unsurprisingly, Dietzen believes they could, especially because such an array makes it easier for distributed nodes to access the storage but also because Pure can make Flash so much cheaper than current offerings. I’m eager to see what the rest of the community thinks. I like what PURE is doping, Can they move it to the tablet device and notebook,with volume in the tablet/pc/smartphone market the csot per gig can fall to under a buck. Is Pure in need of a super salesman, here i am. Quoting Cost per GB based on “Deduped GB” is plain irresponsible. Everyone knows dedupe/compression savings will vary greatly depending on application, data type, and other factors. Since PureStorage is claiming $5/GB assuming 80% dedupe/compression reduction, that really means they are charging $25/GB for the actual capacity, making their solution the most expensive consumer-grade MLC-based storage product on the planet. The First All Flash Enterprise class array came from Nimbus Data Systems in April of 2010. I am not sure how you can price based on deduped capacity? What are the actual costs of the array? If their claims are true, they could reduce the cost of this equipment even further by replacing the SSDs with HDDs. The power consumption and latency would increase, but the cost would go way down. If their compression and de-duplication methods are good enough, I’m sure a HDD would go a long way. I understand the goal is to achieve affordable flash memory, but why can’t this technology be backported to HDDs as well to realize infrastructure savings? Because none would invest money in HDD based solutions. If it’s doable with today’s technology, why take such a risk? The whole point of exercises like this is to take a big risk and strike a huge multiple on exit. They claim that disk latency and block sizes don’t permit the fast ‘data reduction’ that’s their secret sauce. I worked at Western Digital in 86. We had a blue sky meeting in which our chief scientist predicted this “at some point in the future” One of the key VPs thought he was smoking something! The mention of de-duplication brings ZFS to mind. Is ZFS technology part of what they’re using to pull this off?